Rodriguez's addition comes after a mixed 2014 campaign. After initially struggling for Double-A Bowie in the Orioles' system, Rodriguez turned it around following a trade deadline deal that brought him to Boston. In six games for Portland, Rodriguez went 3-1 with a 0.96 ERA, striking out 39 in 37 1/3 innings pitched. Rodriguez projects to join fellow southpaws Henry Owens and Brian Johnson atop the Pawtucket rotation to begin 2015. 2014 represented a bounce-back year for Coyle as the 22-year-old hit .295/.371/.512 in 97 games for Portland. A third-round pick in 2010, Coyle's stock was down after a poor 2013 season in which he only saw time in 60 games due to injury. Coyle flashed some serious power in 2014, as 16 home runs to go along with that .512 slugging percentage show, though he did strike out 95 times in 336 trips to the plate. 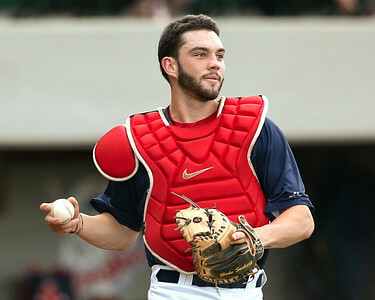 Coyle earned both SoxProspects.com season-end All-Star and Comeback Player of the Year honors, in addition to both Futures Game and Eastern League All-Star nods. Coyle projects to be Pawtucket's starting second baseman to open 2015. Shaw is coming off a 2014 in which his performance for Portland earned a mid-season promotion to Pawtucket. Shaw hit .278/.353/.473 with 21 home runs between the two levels. The 24-year-old was a ninth-round selection the 2011 Draft. Shaw took home a SoxProspects.com All-Star nod to finish off his 2014. He will likely be Pawtucket's starting first baseman come next Opening Day.